Copyright 2011 by Elaine Fitzpatrick. Permission is granted to make and sell items from this pattern provided that credit is given to me as the designer. Permission is not granted to reproduce the actual pattern, or post it, or distribute it, without my express permission. Please respect my copyright and play nice! The PDF file, which includes a chart, is available in the side bar or by clicking HERE . Materials: One skein of worsted weight cotton in a solid color such as Peaches & Crème or Sugar ‘n Cream (approximately 98 yards) if you are using the bib for meals. If, on the other hand, you want to use it as a “drool” bib, I would recommend using a superwash wool. The cotton has a tendency to absorb the moisture, whereas the superwash wool will wick the moisture and keep baby nice and dry! Sample was done in Peaches & Crème Baby Pink. Needles: US 5/3.75 mm or 6/4.0mm You want the bib to be fairly dense, so if the fabric is too loose, just drop down a needle size. Gauge: 4.5 sts. per inch, not critical. 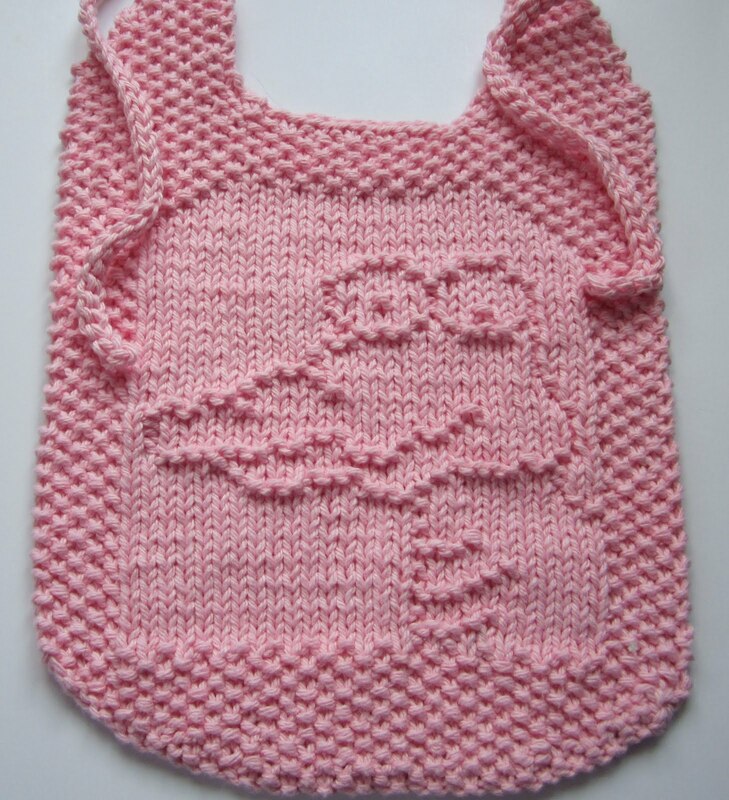 This pattern allows you to choose between two methods of beginning the bib. One uses short rows and the other, more traditional way, requires you to cast on stitches at the beginning of the first few rows of the pattern. There are also two methods for doing the ties. One has crocheted ties and the other method uses knitted I-cords. The crocheted ties are slightly thinner. If you do make the knitted ties, you can drop down a needle size when knitting the cords. I like to run a long tail down the center of the cord to finish it off. Be sure to use a straight needle and not one with a bent tip! For this method, you don’t have to wrap stitches or pick up wraps. You just work the stitches to a point and turn your work around and start knitting in the opposite direction. I’ve written out every row for you and I’ve indicated how many stitches you should have remaining at the end of each row. If you lose your count, all you have to do is check on the number of stitches you have left on your needle and you’ll be right back on track. This technique results in a nice smooth edge. Row 10: Slip 1 knitwise; k1, p1 for 35 sts. Row 11: k1, p1 across row. Continue with *Row 12 of pattern. Pattern: Cast on 15 sts. Row 1: p1, k1 across row. Row 10: k1, p1 across row. *Row 12: (wrong side) (k1, p1) x2; k1; p16; k3; p8; k1; (p1, k1) x2. Row 13: (k1, p1) x2; k8; p1; k20; (p1, k1) x2. Row 14: (k1, p1) x2; k1; p16; k1; p3; k1; p6; k1; (p1, k1) x2. Row 15: (k1, p1) x2; k29; (p1, k1) x2. Row 16: (k1, p1) x2; k1; p16; k3; p8; k1; (p1, k1) x2. Row 17: (k1, p1) x2; k8; p1; k20; (p1, k1) x2. Row 18: (k1, p1) x2; k1; p16; k1; p3; k1; p6; k1; (p1, k1) x2. Row 19: (k1, p1) x2; k6; p1; k22; (p1, k1) x2. Row 20: (k1, p1) x2; k1; p16; k3; p8; k1; (p1, k1) x2. Row 21: (k1, p1) x2; k8; p1; k20; (p1, k1) x2. Row 22: (k1, p1) x2; k1; p16; k1; p10; k1; (p1, k1) x2. Row 23: (k1, p1) x2; k29; (p1, k1) x2. Row 24: (k1, p1) x2; k1; p16; k1; p10; k1; (p1, k1) x2. Row 25: (k1, p1) x3; k10; p3; k3; p3; k8; (p1, k1) x2. Row 26: (k1, p1) x2; k1; p6; k1; p3; k3; p3; k1; p8; k1; (p1, k1) x3. Row 27: (k1, p1 ) x2; k3; p1; k6; p1; k11; p1; k6; (p1, k1) x2. Row 28: (k1, p1) x2; k1; p2; k6; p10; k4; (p2, k1) x2; (p1, k1) x2. Row 29: (k1, p1) x2; k4; p2; k7; p3; k2; p2; k6; p1; k2; (p1, k1) x2. Row 30: (k1, p1) x3; k1; p8; k2; p3; k1; p8; k1; p2; k1; (p1, k1) x2. Row 31: (k1, p1) x2; k2; p1; k7; p2; k14; p1; k2; (p1, k1) x2. Row 32: (k1, p1) x3; k1; p16; k1; p6; k1; (p1, k1) x3. Row 33: (k1, p1) x2; k2; p1; k5; p1; k12; p1; k2; p2; k3; (p1, k1) x2. Row 34: (k1, p1) x2; k1; p4; k2; p19; k1; (p1, k1) x3. Row 35: (k1, p1) x2; k2; p1; k13; p1; k4; p1; k7; (p1, k1) x2. Row 36: (k1, p1) x2; k1; p7; k1; p2; k1; p13; k1; p2; k1; (p1, k1) x2. Row 37: (k1, p1) x2; k3; p1; k14; p2; k9; (p1, k1) x2. Row 38: (k1, p1) x2; k1; p10; k1; p12; k1; p3; k1; (p1, k1) x2. Row 39: (k1, p1) x2; k4; p1; k12; p1; k11; (p1, k1) x2. Row 40: (k1, p1) x2; k1; p11; k2; p10; k1; p3; k1; (p1, k1) x2. Row 41: (k1, p1) x2; k4; p1; k1; p3; k3; p3; k14; (p1, k1) x2. Row 42: (k1, p1) x2; k1; p12; k1; p3; k1; p1; k1; p3; k1; p4; k1; (p1, k1) x2. Row 43: (k1, p1) x2; k4; (p1, k2) x2; p1; k5; p1; k12; (p1, k1) x2. Row 44: (k1, p1) x2; k1; p11; (k1, p2) x2; k1; p5; k1; p3; k1; (p1, k1) x2. Row 45: (k1, p1) x2; k4; (p1, k5) x2; p1; k12; (p1, k1) x2. Row 46: (k1, p1) x2; k1; p11; (k1, p5) x2; k1; p3; k1; (p1, k1) x2. Row 47: (k1, p1) x2; k5; p1; k3; p1; k1; p1; k3; p1; k13; (p1, k1) x2. Row 48: (k1, p1) x2; k1; p13; k3; p3; k3; p5; k1; (p1, k1) x2. Row 49: (k1, p1) x2; k29; (p1, k1) x2. Row 50: (k1, p1) x2; k1; p27; k1; (p1, k1) x2. Row 51: (k1, p1) x3; k25; (p1, k1) x3. Row 52: (k1, p1) x3; k1; p23; k1; (p1, k1) x3. Row 53: (k1, p1) x4; k21; (p1, k1) x4. Row 54: (k1, p1) x4; k1; p19; k1; (p1, k1) x4. Row 55: (k1, p1) x5; k17; (p1, k1) x5. Rows 56 - 62: k1, p1 across row. Row 63: k1, p1 for 13 sts. Slip sts. just worked onto stitch holder, bind off the next 11 stitches knitwise; work across remaining sts. in established pattern: 13 stitches each side. Note: As you look at the bib with the right side facing, the first shoulder worked will be the left side. All the decreases are made on right side or odd numbered rows. Row 64: (wrong side) k1, p1 across row. With wrong side facing, slip sts. from stitch holder to left needle and join yarn at neck edge. All the decreases are made on right side or odd numbered rows. Row 66: p1, k1 across row. Row 70: k1, p1 across row. Work tie to correspond with the one you worked for the other side. What a cute little croc !! Thanks for the pattern. You are amazing. Your patterns are cute and fun. I love looking at them and have been working up the courage to try one but each one is cuter than the one before and I can't figure out which one to try!!! Do you happen to have a turtle pattern? I'm wanting to make a blanket with the Stretch Cloth, Imp Cloth, Peanut Cloth and a turtle design to coordinate with the bedding set I've picked out for my new little girl coming later this year.